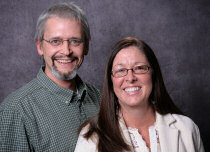 I opened Michigan Holistic Health in 2010 with my wife Annette Crocker, RN. We are the first full-time medical marijuana clinic in southwest Michigan, and we strive to keep the highest standards in the state for medical marijuana certifications and renewals. We are grateful for the opportunity to serve our growing community of patients throughout Southwest Michigan, and promise compassion, confidentiality, and excellent service to everyone. We believe in the healing value of marijuana for patients suffering from chronic or incurable conditions, including veterans and senior citizens. Between the two of us, we have attended thousands of patients in great discomfort, many near the end of their life. We have five children between us, and make our home in Plainwell, where two of our children attend area schools. Annette grew up in Kalamazoo, and her parents, Ray and Rita Miller, help out with our business. We consider all of our talented staff to be family. I am proud of what we are doing here, and welcome your interest. Minors may be qualified to use medical marijuana, but patients younger than 18 must have TWO physicians' certifications and consent from their parent/guardian, who must also act as the registered caregiver for the minor.